With its large, red-rimmed leaves, Kalanchoe "Flapjack" (Kalanchoe thyrsiflora) is a tropical stunner. Flapjack Kalanchoe is appropriately nicknamed for the fleshy leaves that stack one on top of the other like pancakes. This interesting plant, which reaches heights of up to 2 feet at maturity, is also known as paddle plant, desert cabbage and dog tongue. At maturity, the plant develops a spiky, dark yellow bloom. Flapjack Kalanchoe is often grown as an indoor plant, but it can grow outdoors in U.S. Department of Agriculture plant hardiness zones 9 through 11. Uses: Holiday Wreaths, Rock Gardens, and Dish Gardens Succulent plants are some of the hardiest, most drought tolerant in the world and very easy to maintain, as long as they are planted in a porous soil, proper drainage, daily bright light, and not over watered.ABOUT PACKAGE: Your package will be shipped in a box and meticulously bubblewrapped. When opening your package, some soil may be loose in the box. Plant orders are shipped within 3-5 days depending on availability of the plant. We'll try to ship during the week to avoid weekend delay. If you need your order urgently, please message us so we can upgrade your shipping. We ship all year round, heat packs are available for purchase in the winter. 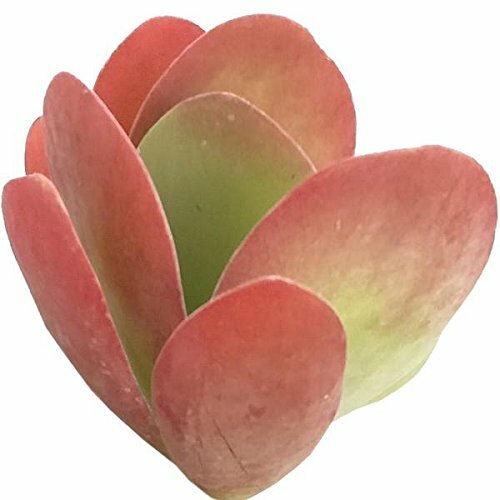 Also known as flapjack paddle plant, this kalanchoe plant is a succulent with thick, paddle-shaped leaves that frequently take on a reddish or deep pink tint during the winter. Kalanchoe luciae is a succulent plant up 2 feet (60 cm) tall. The leaves are in rosettes, big, thick, flat rounded, up to 6 inches (15 cm) long and 4 inches (10 cm) wide, grey-green to yellowish-green in color with red margins. The leaves in some cases will completely turn a vibrant red, especially with cool winter temperatures. Each stem bears clusters of pale yellow tubular flowers. Kalanchoes are not particularly hard to grow, and the flowering varieties are highly rewarding for their colorful and long-lasting flowers. They prefer bright, sunny locations, especially in the summer growing season. During the winter, consider a south-facing window. Water moderately throughout the summer and reduce watering in the winter. If you have any questions about this product by DH7 Enterprise, contact us by completing and submitting the form below. If you are looking for a specif part number, please include it with your message.